Good morning. It's Thursday, Jan. 17. • Nancy Pelosi's extraordinary gambit against President Trump. • American radicals seek to rile up migrants at the border. • And a breakthrough in Los Angeles's teacher strike. 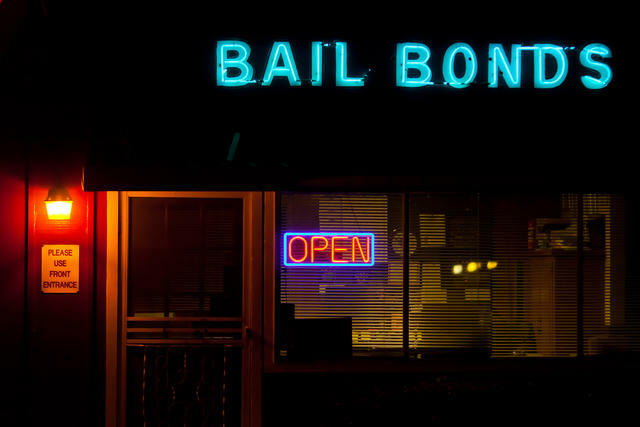 A bail bonds business in Bakersfield. Last year, Gov. Jerry Brown signed a first-in-the-nation law ending cash bail. Now it's on hold. A referendum backed by the bail industry qualified for the 2020 state ballot, giving voters final say on the law's fate. A co-author of the legislation accused the forces behind the referendum of putting profits over justice. A number of California jurisdictions have banned commercial marijuana sales. But they can no longer stop the drug from being delivered inside their borders after state regulators endorsed a rule allowing marijuana deliveries to homes statewide. "The public spoke loud and clear," a spokesman said. "Donald Trump may have finally met his match in Nancy Pelosi." 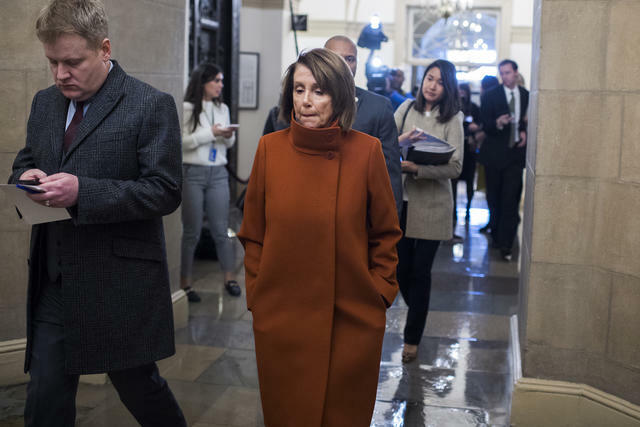 The speaker of the House pulled her most aggressive gambit against the president yet, moving to derail his State of the Union address until the government shutdown is over. The extraordinary step would deprive Trump of one of the brightest spotlights of a president's year. 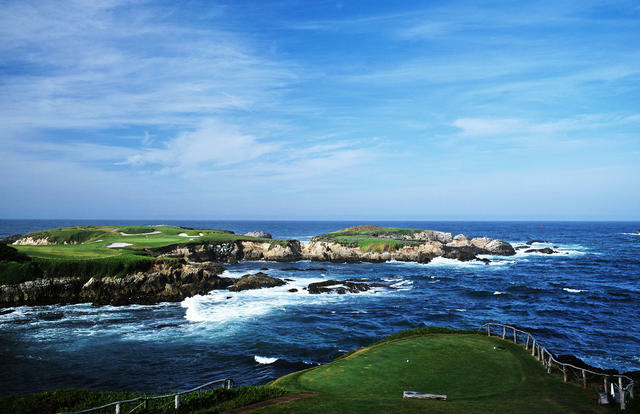 Golf Digest unveiled its biennial ranking of America's 100 greatest golf courses. At No. 3 is Cypress Point Club in Pebble Beach. Its 16th hole, pictured above, has been called the most exhilarating tee shot in golf. Other California courses that made the list: Pebble Beach Golf Links, Los Angeles Country Club, and Riviera Country Club in Pacific Palisades. One of Andres Amador's designs on a Northern California beach. 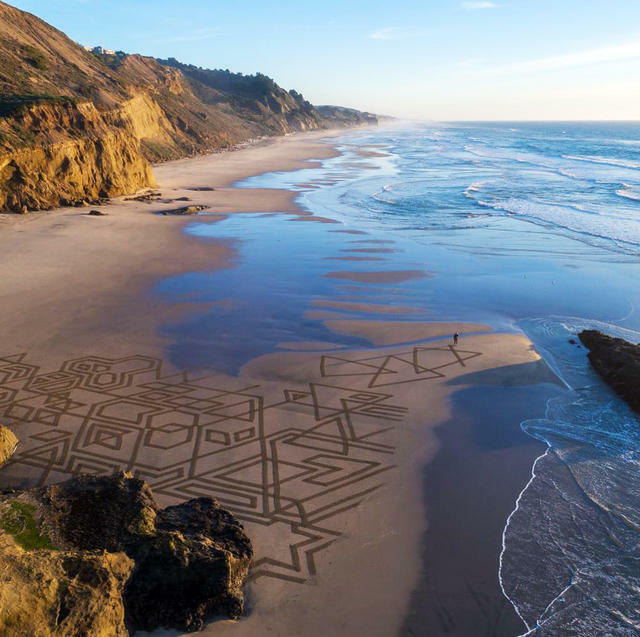 A San Francisco artist uses rakes and ropes to create large-scale sand murals along the Northern California coast — only to have them swept away by the tide. Andres Amador found his passion about 20 years ago after leaving a job as a computer technician. "I felt a yearning I could not understand," he said. 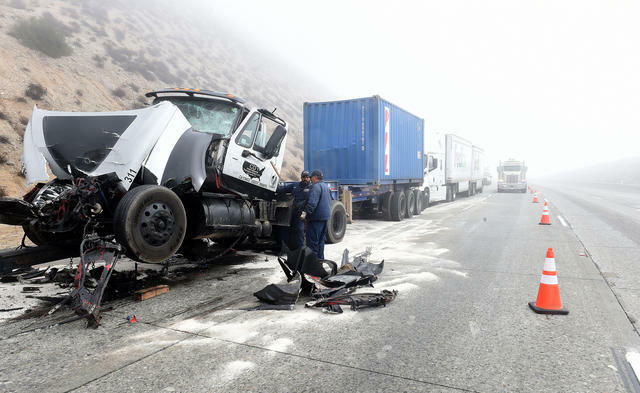 A major pileup in the Cajon Pass was blamed in part on the weather on Wednesday. Five people dead. More than 46,000 customers without power. A 19-vehicle pileup. A storm battered California with torrential rain and winds so powerful they sent trees toppling on Wednesday. Los Angeles was projected to get a month's worth of rain in the span of two days. Rain and snow were expected to continue through Thursday, then start to clear up on Friday. Next week's forecast: Dry. The U.C. 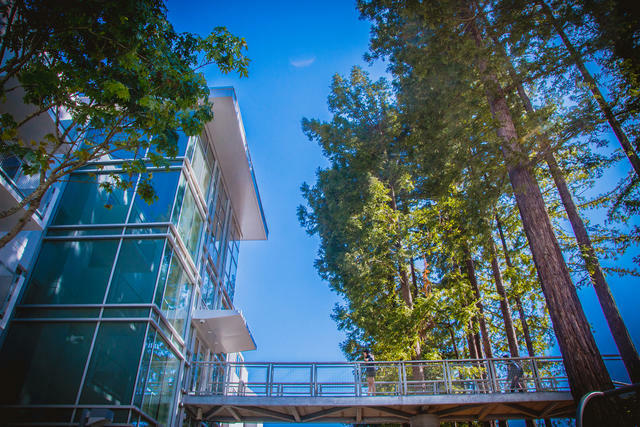 Santa Cruz campus was designed to blend into nature. U.C. Santa Cruz has one of the most beautiful college campuses in the country, with soaring redwoods and golden meadows overlooking the Pacific. But a severe housing crunch has led the university to propose a new student housing complex in a beloved meadow. The plan has triggered an emotional fight with opposing sides trading accusations of NIMBYism and a betrayal of the campus's identity. The geyser is powered by a subterranean volcano. California has an Old Faithful of its own, not as powerful as its namesake in Yellowstone but every bit as faithful. 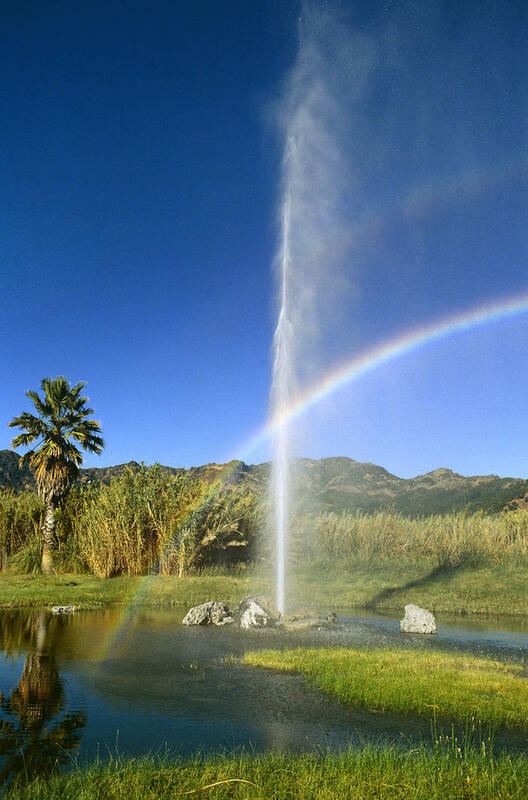 The geyser in Napa Valley spouts off every 40 minutes or so, shooting scalding hot plumes 60 feet into the sky. It was created when a 19th-century settler drilling for a well pierced a natural steam pocket. The geyser is now the centerpiece of a park with gardens, a picnic area, and bocce courts. 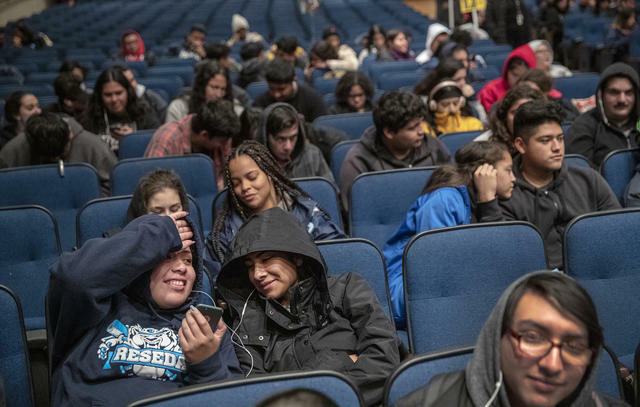 Reseda High School students sat in an auditorium while teachers were out on strike. The Los Angeles school district and negotiators for 30,000 striking teachers agreed to return to the bargaining table on Thursday, with Mayor Eric Garcetti acting as mediator. The breakthrough capped the third day of a strike in the nation's second-largest school district. On Wednesday, only about a quarter of the nearly 500,000 affected students went to school — which have essentially turned into movie theaters. "You need to think about moving." In Long Beach, scientists warned residents near the coast that the encroaching sea could render their neighborhoods uninhabitable within a generation or two. Up the coast in San Francisco, regulators are trying to pass an ordinance that requires property owners to warn prospective buyers about flood risks. 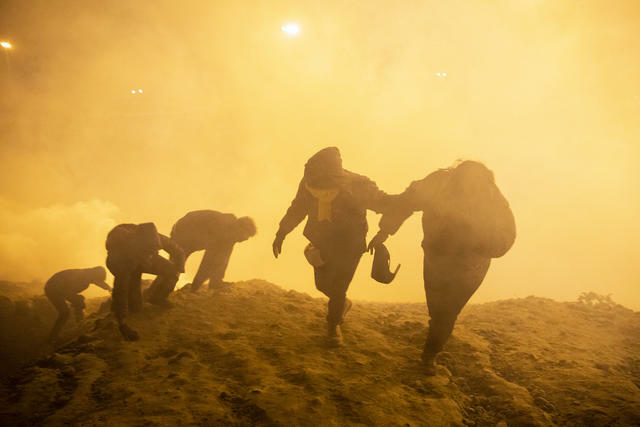 Migrants fled tear gas thrown by border patrol officers in Tijuana this month. Leftist American activists have been going south of the border and encouraging migrants to storm the border en masse. Migrant advocates say flyers spread by the radical group By Any Means Necessary, founded in Berkeley, are putting lives in danger. "That is not solidarity," one said. "That's exploitation. They're exploiting migrants to make a political point." SpaceX said it would build its Mars spaceship in Texas instead of the Port of Los Angeles. The Hawthorne company said it was seeking to "streamline operations." The decision was a crushing letdown for local officials who have aimed to brand the harbor area as a burgeoning tech hub. 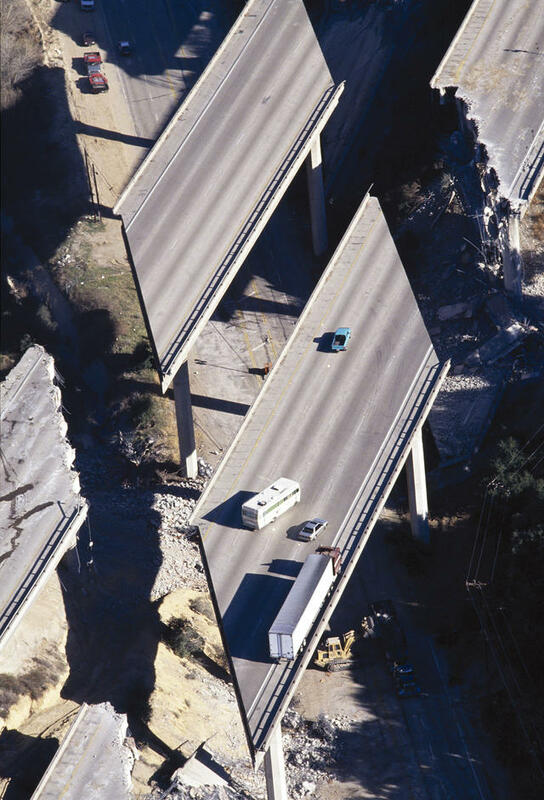 Vehicles were stranded on Interstate 5 on Jan. 17, 1994, after the Northridge earthquake. It was on this day in 1994 that a savagely powerful earthquake shook Los Angeles from its predawn sleep. The Northridge earthquake collapsed buildings and turned freeways to rubble, leaving more more than 70 people dead and about 9,000 others injured. Scientists say the next big one is only a matter of time. Computer models have projected that a major quake along the San Andreas fault could kill 1,800 people and displace as many as 270,000. Here's a look back in photos at the Northridge earthquake by the Atlantic, and a look forward at the potential disaster to come by Curbed.